DIY personalized photo collages and digital scrapbooks, Enjoy your life. *Choose from collage templates, simply drag and drop, and then with only a few more mouse clicks your stunning photo collage will be ready. *Personalize your photo collage with your own digital photos. *Share your photo collages on MySpace, Facebook, Flickr with others. *Decorate your photo collage with frames, masks, text and cliparts. *Use image effects to make your photos look like faded on the edges, old-fashioned, etc. 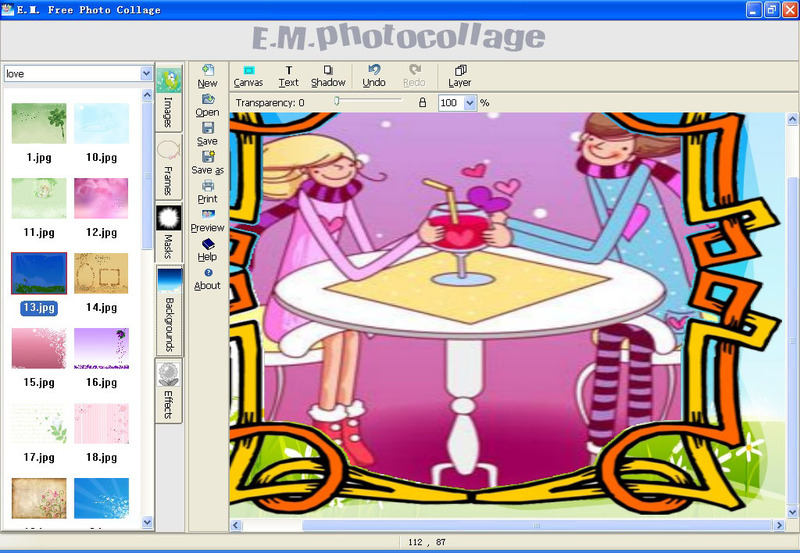 *Save collages as popular image format such as .jpg, .bmp, .png, .gif, .tiff or make it as wallpaper. *Create your own collage templates. *Print and send your collage to friends and family. PhotoMix - digital scrapbooking and photo collage software. Instantly turn your digital photos into an attractive photo websites. Create amazing photo collages and scrapbooks really fun and creative. Powerful tool to imprint text, browse, download, view, edit and master photos. Helps you to manage, edit and publish photos from your digital camera. The Ultimate Safe Money Guide - Free Money Make Your Online Money The Safe Way. PhotoELF is an image processing toolbox with hundreds of features. Easy to use. Qweas is providing links to E.M. Free Photo Collage 1.30 as a courtesy, and makes no representations regarding E.M. Free Photo Collage or any other applications or any information related thereto. Any questions, complaints or claims regarding this application E.M. Free Photo Collage 1.30 must be directed to the appropriate software vendor. You may click the publisher link of E.M. Free Photo Collage on the top of this page to get more details about the vendor.